A 42-year-old woman has been delivered of five babies (quintuplets) at Federal Medical Centre (FMC) Lokoja, Kogi, after 18 years of barrenness, the News Agency of Nigeria (NAN) reports. 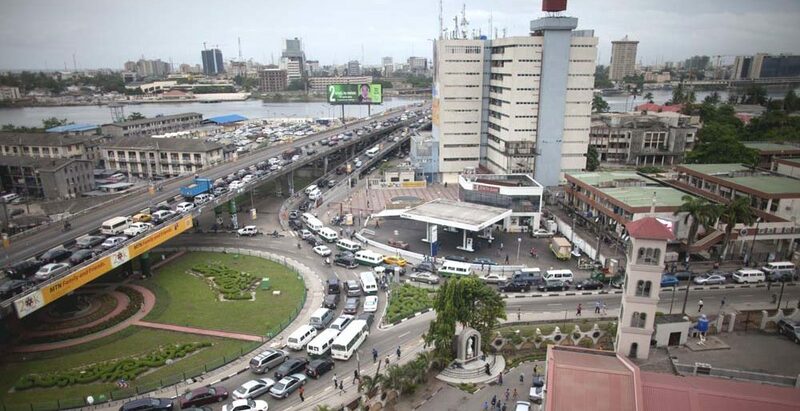 A correspondent of the News Agency of Nigeria (NAN) who visited the woman and her babies at the hospital on Friday reports that both mother, Mrs Uchenna Okeigbo and her kids are in good condition. Okeigbo, an indigene of Olokoro Amangbo Community, Umuahia South Local Government Area of Abia, gave birth to three boys and two girls on April 17 through a Caesarean Section. Speaking with NAN, the woman expressed gratitude to God for the rare gift of five babies, saying that her wait for 18 years did not end in vain. “It is not easy to have five children at once,” Okeigbo said. She showered praises on her husband for standing by her. NAN further reports that the quintuplets, three boys and two girls, weighed 1.3kg 1.6kg, 1.7kg, 1.8kg and 1.9kg, respectively. However, the first baby, who weighed 1.3kg was still inside the incubator as at the time of NAN visit. 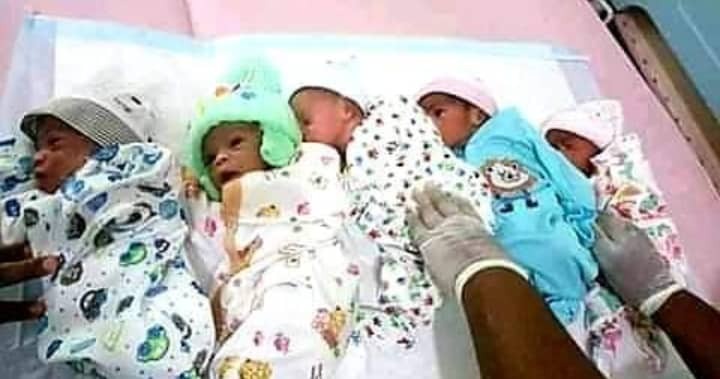 The father of the quintuplets, Mr James Okeigbo, 47, an employee of a private establishment, who was overwhelmed with joy, described the coming of the babies as the happiest moment of his life and his wife as well. ”I thank my wife for retaining her respect for me for this 18 years of childlessness without quarreling with me. “I am also grateful to her family for standing by us,” Okeigbo said. He, however, solicited for assistance from government and members of the public to ensure adequate care for the five children. ‘ As a good citizen of Nigeria, I am appealing to government to help us,” he said. Dr Grace Ogoke, Consultant, Obstetrician and Gynecologist at FMC, Lokoja, who handled the delivery of the quintuplets, said she was very happy and gave glory to God for the feat. She told NAN that she delivered the babies on Wednesday April 17, through a Caesarean Section (CS) at about, 11:45 pm, which coincidentally was her own wedding anniversary day. ”They are three boys and two girls, and they weighed 1.3kg, 1.6kg, 1.7kg, 1.8kg and 1.9kg, respectively. The three boys came first and the one that first came out has the least weight of 1.3kg. ” The baby is put under observation inside an incubator because he weighs less than 1.5 kg but the baby is active,” Ogoke explained. According to her, the couple approached the FMC when they were seeking for the fruit of the womb with lots of investigations. ”After going through all their investigations, I saw that they would need to be assisted, that spontaneous pregnancy medically speaking might not be achievable, and I advised them to be assisted. ” The procedure for the assisted reproductive technology through In-Vitro Fertilisation (IVF) was successful, and the doctor referred them back to her for management of the pregnancy. ”I feel very happy and I give glory to God for seeing us through, because it was like all of us are pregnant during the pregnancy. ”This is my first time of taking delivery of quintuplets, the highest I have taken was three. ‘It is a relief and achievement for all of us and I thank God for that,” Ogoke said. The Chief Medical Director of the Federal Medical Centre, Lokoja, Dr Olatunde Alabi, said that exprienced gyneacologists and padsetricians were deployed to manage the woman from pregnancy to delivery. Alabi said it was the first time quintuplets will be delivered at the hospital, saying that the management of the pregnancy and successful delivery of the babies underscored the quality of staff at the hospital and their dedication to duty. The Chief Medical Director , however, pleaded for more support for the centre from the government and corporate organisations, especially in the areas of equipment and funding. 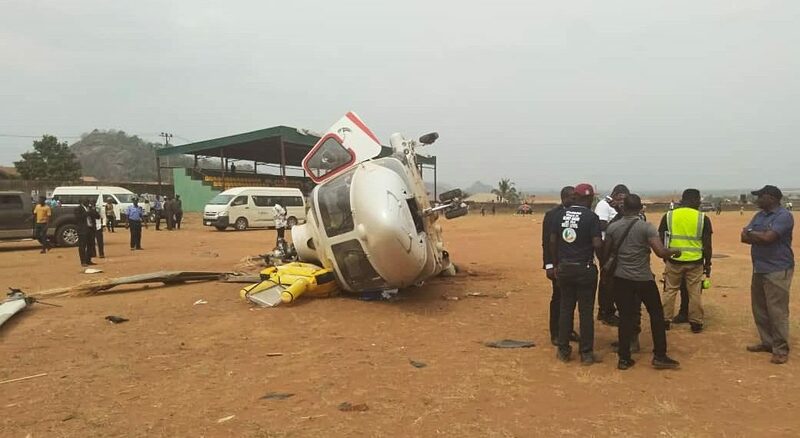 A little more details have emerged regarding how the Vice President, Prof Yemi Osinbajo, escape death in a helicopter crash incident in Kabba, Kogi State. The propeller of Osibanjo’s helicopter was said to have suddenly pulled off at Kabba township stadium. According to an eye witness account, the vice president’s helicopter had managed to land at about 2.22pm at the township stadium before the propeller of the helicopter suddenly pulled off and went flying in the air to the surprise of party faithful who had gathered to welcome him. There was, however, no casualty. Although, the remote cause of the accident was not known as at the time of filing in this report, it was learnt that the pilot of the helicopter might have found it difficult to land due to the dusty nature of the stadium. He later addressed some party supporters at St Augustine’s College, Kabba field. The Kogi and Katsina chapters of the Peoples Democratic Party have rejected the results of the Lokoja/Kogi Federal Constituency and Katsina North Senatorial Zone by-elections, which held on Saturday in the states. The Chairman, PDP Kogi State, Mr Sam Ohuetu, made the call on behalf of the party at a news conference in Abuja on Sunday. Ohuetu alleged that the election was neither free nor fair, insisting that it was marred by violence, snatching of ballot boxes and vote-buying. He also alleged that appointees and key officials of the Kogi State Government who were not indigenes or voters in the constituency were seen intimidating and harassing the electorate with thugs and personnel of security agencies. Ohuetu alleged that during the build-up to the by-election, there were credible and reliable reports of the movement of thugs and hoodlums into Lokoja and Kotonkafe local governments from other local governments within the state and from adjoining states into the constituency. Ohuetu added that the PDP was already drafting a petition to be submitted to the Independent National Electoral Commission. Katsina State Chairman of the PDP, Alhaji Salisu Majigiri, on Sunday, in a telephone interview with The PUNCH, said the opposition party would challenge the results. He said, “We reject the results of the by-election in its totality. The election was fraught with vote- buying, using of government officials to coerce traditional rulers and all sorts of discrepancies that we shall disclose at election tribunal. “What happened at the by-election was like what happened during the Ekiti State governorship election and all these do not augur well for the development of democracy in Nigeria. The Independent National Electoral Commission had on Sunday morning, declared The All Progressives Congress candidate, Ahmad Babba-Kaita, as the winner of Katsina North Senatorial Zone by-election. INEC Returning Officer for the election, Prof Hudu Ayuba-Abdullahi, said Babba- Kaita scored 224,607 votes, while his elder brother of the Peoples Democratic Party, Kabir Babba-Kaita, scored 59,724 votes. Meanwhile, the Governor of Kogi State, Alhaji Yahaya Bello, has congratulated the winner of the just concluded by-election, Alhaji Haruna Isah. In a statement on Sunday, the governor charged the winner to remember that the people who chose to vote for him did so believe that he would represent their interest at the National Assembly. INEC had declared Isah, who polled 26, 860 votes, the winner of the election. The Returning Officer, Prof. Rotimi Ajayi, announced that the PDP candidate, Bashir Gegu, polled 14,845. The candidate of the African Democratic Congress, Alhaji Mohammed Mabo, came third with a total number of 2,984 votes while former Speaker, Umar Ahmed, of the Social Democratic Party, polled 2,916. In a related development, the candidate of the APC in Saturday’s Bauchi-South senatorial by-election, Lawal Gumau, has been declared the winner of the election. Gumau scored a total of 119, 489 votes to beat his closest rival, Ladan Salihu of the Peoples Democratic party, who got 50,256 votes. The Returning Officer of the election, Prof. Ahmed Fagan, of the Abubakar Tafawa Balewa University, Bauchi, announced the results on Sunday. Isa Yuguda, the immediate past governor of the state who contested the seat for the second time, came third with 33,079 votes. In his address at the commencement of the announcement of the results, the Resident Electoral Commissioner, Ibrahim Abdullahi, charged the winner and the losers to accept the results in good faith. Abdullahi commended the electorate for the peaceful way and manner they conducted themselves before and during the elections. In the election, the Speaker of the House of Representatives, Yakubu Dogara, lost his local government area to the PDP. Dogara, who hails from Bogoro LGA and represents Dass/Tafawa Balewa/Bogoro federal constituency in the House, has been rumoured to be planning to defect to the PDP. Governor Yahaya Bello of Kogi State fell off while alighting from his official car on Friday, March 30, and injured his left foot, a statement from the Kogi Government House, Lokoja, said on Tuesday. The statement signed by the Director General, Media and Publicity to the Governor, Mr Kingsley Fanwo, said the incident happened at the Old Market area in Lokoja when the governor was waiting to receive the Speaker of the House of Representatives, Mr Yakubu Dogara. The Speaker had visited Lokoja for the burial of Mr Umar Buba Jibril, a member of the House of Representatives, who died in Abuja on Friday. “The injury prevented the governor from attending the burial of Jibril. He was represented by his deputy, Mr Simon Achuba,” the statement said. It dismissed claims that Bello was hospitalised and incapacitated, stating that the governor was promptly treated by his doctors, who bandaged the leg and discharged him. The government thanked the governor’s supporters for their concern over his health, saying that Bello was doing well and would resume work after the Easter holidays. The News Agency of Nigeria reported that the clarification was necessitated by reports that the governor was critically injured in the accident. However, a source who witnessed the accident told one of our correspondents that the governor, who was trying to alight from his car, a BMW which is smaller than his official Prado Jeep, tripped and sprained his left ankle and his two arms. The eyewitness disclosed further that the car dragged the governor for some metres before he was rescued by some people and his security details. He added that the governor was rushed to one of the private hospitals in Abuja for further treatment. But Fanwo, in a statement on Tuesday, said Bello only injured his left foot while alighting from the vehicle. Due to the accident, Bello on Tuesday attended a meeting at the Presidential Villa, Abuja on crutches. The meeting was between President Muhammadu Buhari and all the governors elected on the platform of the ruling All Progressives Congress. No fewer than 10 famers were killed on Friday as Fulani herdsmen invaded two local government councils in Kogi State after allegedly setting their farmlands on fire. The incident took place in Omala and Yagba West local government councils. According to an eyewitness account Saturday, some Fulani herdsmen invaded Ogabifo Village near Agbenema Community and Agbabifo in Omala Local Government Area and killed the younger brother of the community chief, Paul Awodi after ransacking the community and setting some houses on fire. It was further gathered that after invading the village, the Fulani herdsmen went back to the farm and destroyed their crops and escaped unchallenged. A source said the five herdsmen were fully armed with AK 47 and other weapons. Following this, residents in the community fled the place in fear of another attack as the herdsmen were said to have been emboldened as a result of Governor Yahaya Bello’s order that Kogi residents must accommodate the herdsmen. In a similar incident, Fulani herdsmen also invaded another farmland in Yagba West Local Government Council of the state. A farmer, who did not want his identity revealed disclosed that the attacker herdsmen were fully armed when they arrived the farmland. He added that other farmers were in their farm working when they heard gun shots when the herdsmen invaded the farms. He therefore appealed to the state government to take a proactive step by calling the herdsmen to order. The Kogi State governor, Bello last week had said that he will not introduce any anti grazing law to curtail herdsmen in the state. The Economic and Financial Crimes Commission on Monday traced N860m to the immediate past governor of Kogi State, Idris Wada; and a former acting governor of Taraba State, Sani Danladi. While N500m was traced to Wada, N450m was traced to Danladi. The money was said to be part of the N23bn allegedly disbursed by a former Minister of Petroleum Resources, Diezani Alison-Madueke, through the then Director of Finance of the Goodluck Jonathan Campaign Organisation, Senator Nenadi Usman. It was learnt that Wada arrived the EFCC office around 12pm and was still in custody around 9pm. The spokesman for the EFCC, Mr. Wilson Uwujaren, confirmed that Wada was detained by the commission. The Gombe zonal office also quizzed Danladi in respect of the N450m collected by him through Senators Joel Dallami Ikenya and Mark Useni during the build-up to the 2015 presidential election. Danladi, in his statement on oath, told interrogators that he chaired the eight-man committee that disbursed the money for Taraba State. Danladi was arrested and detained in Abuja last week and later released on bail to reliable sureties, but asked to report to the EFCC Gombe zonal office for further investigation. Last week, the commission detained a former governor of Benue State, Gabriel Suswam, for his role in the disbursement of the Diezani sleaze. In the states which were ruled by the PDP, the governors were said to have taken possession of the funds while in states that had no PDP governors, the ministers handled the money. They were alleged to have received a minimum of N450m each. Some of the former governors and ministers that may be picked up soon include a former Minister of Power, Mohammed Wakil (Borno); and a former Minister of Science and Technology, Alhaji Abdu Bulama (Yobe). Others are former governor Sullivan Chime of Enugu State (now a member of the All Progressives Congress), the immediate past governor of Kebbi State, Saidu Dakin Garin; former governor Ibrahim Shekarau of Kano State, former governor Ali Modu Sheriff of Borno State, former governor James Ngilari of Adamawa State; and a former governor of Zamfara State, Mamuda Shinkafi. Sheriff allegedly received N40m from the N450m said to have been received by a former Minister of Power, Mohammed Wakil. Also, a former deputy governor of Edo State, Chief Lucky Imasuen, and a former Secretary to the State Government of Edo State, Pastor Osagie Ize-Iyamu, may be re-invited for allegedly collecting N700m from the Diezani fund. The Senator representing Kogi West, Dino Melaye, once again escaped another attack, on Saturday, during Kabba Day Celebration when some hoodlums attacked him with stones, pure water sachets and other dangerous objects, including charms. Governor Yahaya Bello, who was already at Kabba for the occasion, refused to show up at the venue following a security report of the incident. It was quick intervention of security personnel at the venue that saved the situation. The advanced party of the governor and government appointees were already at the venue before the attack on Sen. Melaye. Sen. Melaye was specially invited by the organisers to honour the Kabba Day celebration when the attack took place. It all started when the Masters of the Ceremony called on the senator to present his speech and make a donation before the arrival of the governor, to the venue which was at the township stadium. Following the articulated speech and subsequent donation of N3 million cash at the venue and while Sen. Melaye was stepping out of the podium and walking to towards his Mecerdez Sport Utility Vehicle (SUV), that some hoodlums attacked him by throwing stones, pure water sachets and other dangerous weapons including charms on him. Sen. Melaye, however, escaped unhurt with the prompt intervention of security personnel at the venue. Some of the thugs were arrested and whisked away in Prison vehicle with registration number PS 300A 0/1. The security men had to use tear gas to bring the situation under control. Meanwhile, all the security apparatus of the state governor led by his ADC and the Chief Details were at the venue ahead of Governor Bello who was expected to grace the occasion. It was, however, gathered that when security report got to the governor who was already at the Golden Grand Royal Hotel, at Kabba, he decided to go back to Lokoja to avoid any trouble. Sources close to the organising committee disclosed that the attack on the Senator might have stop the governor from coming to the venue.